Mirage fighters were a feature of motorway travel in France in the ‘seventies and, flying in formation above the Autoroute near Dijon, evoked the over-dubbed delights of The Aeronauts*** a Saturday morning TV programme shown alongside Robinson Crusoe and The Flashing Blade. 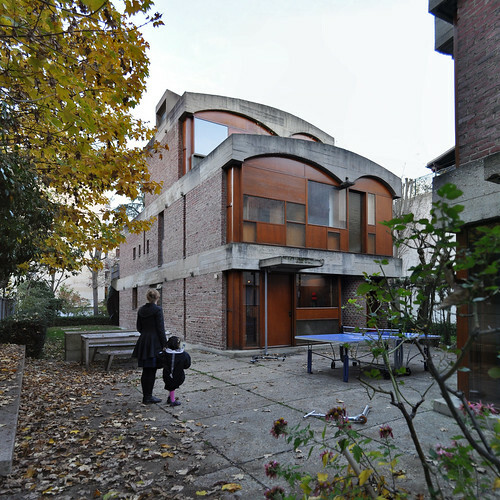 seier+seier’s photograph of Le Corbusier’s Maisons Jaoul. Click here for picture & discussion. To Liverpool for one of the talks in the Le Corbusier Lives! season hosted by Liverpool John Moores University, and for a second look at the Corb exhibition in the Metropolitan Cathedral crypt. The talk was actually a series of short talks by Adrian Forty, Irena Murray and Alan Powers regarding Le Corbusier and Britain. The subject matter sounded quite wide but soon narrowed down to observations on Corb’s correspondence with British students (lots of headed paper from the Students Common Room at the AA in Bedford Square) and practising architects in the pre-war period. Only Alan Powers had the light delivery and humorous touch to make the material live. One could imagine P.G. Wodehouse writing some of the letters, and there was a wonderful self-description of a British architect (was it Maxwell Fry?) ripping up his Beaux Arts student work and committing himself to the application of the portal frame to the problem of housing. The audience did not really respond to the theme presented by the historians and instead attempted to widen the discussion to bigger questions of architectural determinism. The panel discussion produced, for me, only two interesting observations: Corb didn’t seem to like people very much, and his youthful exposure to Ruskin’s ideas and writings may have re-emerged and influenced his work after the war. 1936: trip to South America in the dirigible Graf Zeppelin for a lecture series; contacts Oscar Niemeyer, Lucio Costa and Affonso Eduardo Reidy in Rio de Janeiro. The combination of the great architect, the German airship, and Sugar Loaf is irresistible. To Liverpool for the architectural event of the autumn – the collision between Lutyens and Le Corbusier in the Metropolitan Cathedral Crypt. Unfortunately the overbearing and labyrinthine staging of the exhibition makes what might have been an interesting combat between these two titans difficult to discern. The spatial and material genius of Lutyens is cleverly obscured to enhance the importance of the most famous bespectacled Swiss, although an interesting family of geometrically abstract holy water stoups peak provocatively around planar screens, presenting a cunningly utilitarian riposte to Le Corbusier’s ‘sculptures’. Leaving these frustrations aside, however, the exhibition is comprehensive, giving a full account of Le Corbusier’s career. The early years are well represented, and the presentation continues in a slightly confusing way through to the last works, notably the Philips Pavilion which is given the full audio-visual reconstruction treatment. Physical models, both original and recent are complemented by virtual reconstructions of unbuilt projects, notably the Palace of the Soviets. Small electronic panels flick through examples of Le Corbusier’s sketchbooks, and archive films add life to the sometimes arid display. In totality it is an exhibition best suited to the initiates of architecture which will do little to spread understanding of his work beyond the existing fan base. However, for those of us already in the club, it is well worth the trip. See also Eisenman in Liverpool! OK, the main event is obviously the opening of the Corb exhibition in Lutyens’ crypt (the subtitle ‘The Art of Architecture’ doesn’t inspire) but Peter Eisenman has got to be worth a trip. Posted on September 18, 2008 March 22, 2009 Author Sally StoneCategories CiA, Dominic Roberts, Edwin Lutyens, Le Corbusier, Liverpool, Name Dropping3 Comments on Eisenman in Liverpool! The bow-tie appears at 6.00 am. The hat changes but the spectacles are constant, not vanishing until just before midnight, although they were raised briefly after lunch. 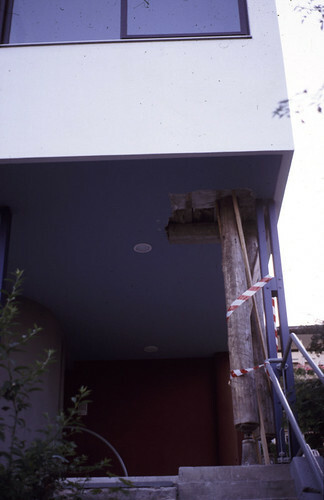 Doppelhaus/Two-family house by Le Corbusier at Weissenhofseidlung Stuttgart.